Many photographers dream of one day shooting for National Geographic and traveling to far off lands – I know it was always my dream – and this competition may very well be your best chance to live that dream. 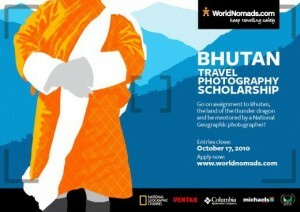 Worldnomads.com, National Geographic Channel & JoJo’s Adventures Bhutan are giving one exceptional individual the chance to go on assignment with renowned wildlife photographer Jason Edwards to The Kingdom of Bhutan – land of the Thunderdragon! In short, the key part of the prize is a 7 day trip from December 5- December 12, 2010 to Bhutan which will include working on assignment with Jason Edwards. To enter you will need to submit of photo story about a place you have visited (note a ‘place’ can be anywhere from your backyard to exotic islands) that does not exceed more than 5 images in total. For more details head on over to Worldnomads.com and be sure to watch the video below for some tips from Jason Edwards himself.